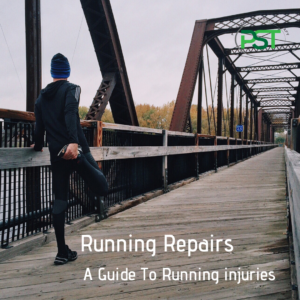 Generally most injuries runner pick up are of a “repetitive strain” nature and runner’s knee is no exception. Given the nature of running, this isn’t really that big a surprise. There aren’t really many demands in terms of changing direction or speed. It is very much about simply putting one foot in front of the other. With this in mind what we tend to see is a “simple” case of exceeding the ability to the tissues to adapt to the load being placed on them. I say simple but there is a bit more to it than this but lets start with the simple part. When we say exceed tissue capacity what we are talking about is the inability to recover between sessions to the extent where we eventually see tissues getting irritated and sore. This can be due, at least in part, to a greater recruitment of the muscle to do even low level tasks and they gradually fatigue faster and lose their elasticity. The less simple part of the equation is that it isn’t just dependant on the stress from running but everything else going on in your life needs to be taken into consideration as well. Busy at work? Got a sick child and not getting a lot of sleep? etc etc all of these add up and can reduce you’re recovery ability by around 60%. If we look at the forces at play when running the ground reaction force coming up through the leg is generally around 3 x body weight and the peak force going through soleus is around 7x body weight. So anyone who thinks running is a low level activity is very mistaken. It is for this reason that the addition on strength training has been shown to reduce knee pain by around 60-70%. Soleus plays an important role in stabilising the knee as we move through from hitting the ground to pushing through as we drive off. In fact you could argue that when we are running the lower leg and hamstrings main role is to stabilise the knee in through this part of the movement. So what to do if the knee is sore? These can be split into two categories. 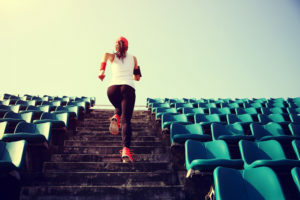 Cases where running would have a negative impact on recovery. These include bone stress injuries and reactive tendinopathies. I recommend no running at all and seek to use other modalities to maintain fitness. but outside of these it is more about manipulating the training load so that running can be continued. In cases where the pain doesn’t reduce over a 24 hour period the overall volume should be reduced. The pain should never be more than a 2/10 at any point during the run. It should subside quickly once the run has finished. Strange as it may seem we do want to find this 2/10 point. Below this level and there isn’t enough training stress and you will lose training effect. Above 2/10 and it you’ll make things worse. It may be that 5 miles is fine but after 6 or so things creep up to a 2/10. After this point things get a lot worse and don’t settle quickly once your finished. Changing foot strike from a heel strike to a fore foot strike can help reduce the stress on the knee. It is worth remembering it brings with it an increased loading on the ankle. This will work well for some but not others. Another aspect of this is that it takes time to master and not be forced which can even more problems. Manipulating cadence can also be useful for this reason and is worth looking into as it is easy to do and doesn’t have a big learning curve. So if you are suffering from knee pain the first thing to do is reduce the overall volume of training. This might mean running on alternate days or maintaining your schedule at a reduced daily mileage. How you do this can be down to personal preference. How many days you run etc is a factor to be manipulated to get the desired outcome. Some benefit from higher frequency others don’t. Looking at these factors allows us to individualise your rehab. Monitoring non training stress is also important. Look to find ways to help deal with it, making sure you get enough sleep. Meditation can be useful in terms of aiding relaxation. The quality and quantity of food being eaten is also very important. Previous PostPrevious Plantar fasciopathy – a pain in the foot.